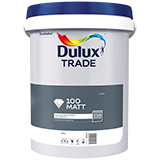 Dulux Trade 100 Matt is a pure acrylic interior and exterior product with a matt finish that has outstanding stain resistance.Suitable for application to new or previously painted plaster and fibre cement. Matt finish does not show up minor plaster imperfections. Provides excellent stain resistance and washability (complies with Class 1 of the SABS standard for scrub resistance - SANS 6258:200x Edition 2). Quick drying - two coats can easily be applied in one day. No hassles with cleaning up - wash equipment with tap water. Non-yellowing - white and colours will not yellow with age.